If you’ve been thinking about outsourcing your social media management, but have been uncertain how to do it well and how to make sure that it delivers results for your business, here are 6 important steps for making it work for you. Have you been considering outsourcing your social media management, but have been worried about how exactly the person supporting you will know what’s best for your business? How will what they post day to day on your Facebook or Instagram timeline be good for your business? Hopefully, you already know the answer to that question because you have a digital marketing strategy in place, or at the very least a social media content strategy. If you’re embarrassed because you don’t even know what those two things are, then this post is for you. Let’s make things really, really simple. Social media is there not just to be social and look pretty, although that is one of its uses. Social media is primarily there to add value and profit to your business. 1.What do you want to achieve? – and this may change over time – week to week, or month to month. This may also vary throughout the day, or week. More subscribers to your newsletter? More people attending your events? 2. What kind of client do you want to attract? Depending on the clients you want to attract you will post different content. Do your research – Facebook Page insights will tell you at what time of day specific types of clients (age and gender) use Facebook. You can then time your posts to reach those clients. 3. What action do you want the client to take when they see your social media post? Subscribe to your mailing list. 4. What kind of posts do you want your VA to create? How much input do you want into what is posted on a daily basis? Do you want to approve each post on each social media channel, or will you let your VA run the show as long as it’s within the strategy? Will they consist mostly of images – how will they create them? Will they have regular access to your premises if they need to take photos of your “behind the scenes” or products? What kind of text only posts and links will they post? Will you supply them, or will your VA need to research to post relevant article links? 5. Which parts of your strategy will address the getting to “know, like and trust” you components of your marketing strategy? 6. How will you measure the results of your VA’s work? You might want to ask your clients – how did they hear about you when they make a purchase or make an appointment and listen for mention of social media. Do you have a measurable way of tracking sales from the date of the start of your social media strategy implementation? Ask clients to share photos of themselves with your products, if appropriate, using a hashtag you’ve chosen. Ask clients to share their experiences of your business/product or service using your unique hashtag. You can then track the use of the hashtag on a weekly basis across Twitter, Instagram and Facebook. Once you have answers to these 6 questions, bring all the information together as your social media management strategy. This should clearly define the purpose, implementation and measurement of your social media management. It should also contain enough information for both you AND your VA to feel confident that they are fulfilling your business goals when they are creating your social media posts on a daily basis. Make sure you have a weekly check-in with your VA to see how things are going. Before you go into that meeting spend 10-15 minutes going over your business’s social media posts for the week so you know what’s been happening. Together, discuss what’s worked and what hasn’t. Try to work out why. Decide on a plan for the next week, including any paid campaigns. 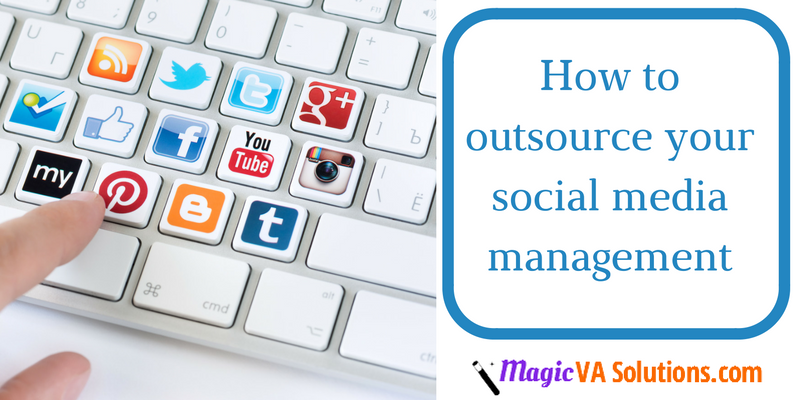 If you follow this planned approach, outsourcing your social media management should be a breeze.